PESHAWAR, 18 May 2016: Two consecutive bomb blasts in Mathra area of Peshawar in the morning killed one person and injured 17 others. The two explosions were caused by remote-controlled improvised explosive devices (IEDs). 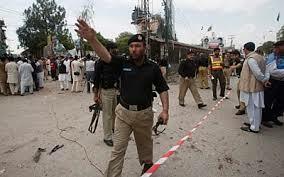 The first explosion targeted a police mobile van which resulted in casualties. The second explosion was caused when additional police enforcements, bomb disposal squad and rescue staff reached the spot. According to a police official, the IED could have weigh 4.5 kg. It is pertinent to mention that the explosions were caused when the government was conducted anti-polio drive in the area. It can therefore safely be surmised that the attackers may have wanted to target the polio workers and the accompanying security officials. Although no group has so far claimed responsibility for the attack, two infamous Taliban militant groups – Tehrik-e-Taliban Pakistan Jamaatul Ahrar (TTP-JA) led by Omar Khalid al-Khorasani and TTP-Darra Adam Khel led by Omar Mansour aka Narai – are reported to have operated and conducted terrorist attacks in the area. Mathara lies on the Warsak Road, where TTP’s Omar Mansour conducted a high profile attack on the Army Public School on 16 December 2014 in which hundreds of students were killed.